Dr. Ujala Nayyar dreams, both figuratively and literally, about a world that is free from polio. 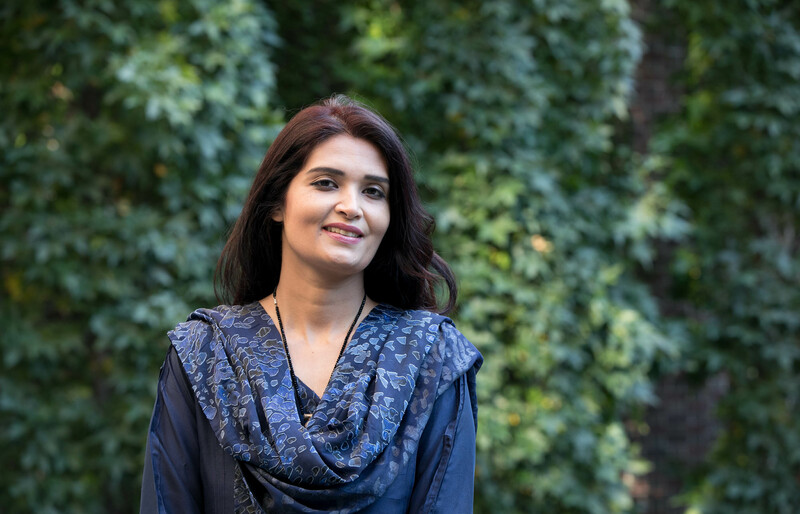 Nayyar, the World Health Organization's surveillance officer in Pakistan’s Punjab province, says she often imagines the outcome of her work in her sleep. In her waking life, she leads a team of health workers who crisscross Punjab to hunt down every potential incidence of poliovirus, testing sewage and investigating any reports of paralysis that might be polio. Pakistan is one of just two countries that continue to report cases of polio caused by the wild virus. Dr. Ujala Nayyar, surveillance officer for WHO, talks about polio eradication efforts in Pakistan. In addition to the challenges of polio surveillance, Nayyar faces substantial gender-related barriers that, at times, hinder her team's ability to count cases and take environmental samples. From households to security checkpoints, she encounters resistance from men. But her tactic is to push past the barriers with a balance of sensitivity and assertiveness. "I'm not very polite," Nayyar said with a chuckle during an interview at Rotary's World Polio Day last year in Philadelphia, Pennsylvania, USA. "We don't have time to be stopped. Ending polio is urgent and time-sensitive." Women are critical in the fight against polio, Nayyar says. About 56 percent of frontline workers in Pakistan are women. More than 70 percent of mothers in Pakistan prefer to have women vaccinate their children. That hasn't stopped families from slamming doors in health workers' faces, though. When polio is detected in a community, teams have to make repeated visits to each home to ensure that every child is protected by the vaccine. Multiple vaccinations add to the skepticism and anger that some parents express. It's an attitude that Nayyar and other health workers deal with daily. "You can't react negatively in those situations. It's important to listen. Our female workers are the best at that," says Nayyar. With polio on the verge of eradication, surveillance activities, which, Nayyar calls the "back of polio eradication", have never been more important. Q: What exactly does polio surveillance involve? A: There are two types of surveillance systems. One is surveillance of cases of acute flaccid paralysis (AFP), and the second is environmental surveillance. The surveillance process continues after eradication. Q: How are you made aware of potential polio cases? A: There’s a network of reporting sites. They include all the medical facilities, the government, and the hospitals, plus informal health care providers and community leaders. The level of awareness is so high, and our community education has worked so well, that sometimes the parents call us directly. Q: What happens if evidence of poliovirus is found? Dr. Ujala Nayyar, the surveillance officer for the World Health Organization in Punjab, Pakistan, navigates through barriers to hunt down cases of polio. A: In response to cases in humans as well as cases detected in the environment, we implement three rounds of supplementary immunization campaigns. The scope of our response depends on the epidemiology and our risk assessment. We look at the drainage systems. Some systems are filtered, but there are also areas that have open drains. We have maps of the sewer systems. We either cover the specific drainage areas or we do an expanded response in a larger area. Q: What are the special challenges in Pakistan? A: We have mobile populations that are at high risk, and we have special health camps for these populations. Routine vaccination is every child’s right, but because of poverty and lack of education, many of these people are not accessing these services. Q: How do you convince people who are skeptical about the polio vaccine? A: We have community mobilizers who tell people about the benefits of the vaccine. We have made it this far in the program only because of these frontline workers. One issue we are facing right now is that people are tired of vaccination. If a positive environmental sample has been found in the vicinity, then we have to go back three times within a very short time period. Every month you go to their doorstep, you knock on the door. There are times when people throw garbage. It has happened to me. But we do not react. We have to tolerate their anger; we have to listen. Q: What role does Rotary play in what you do? A: Whenever I need anything, I call on Rotary. Umbrellas for the teams? Call Rotary. Train tickets? Call Rotary. It's the longest-running eradication program in the history of public health, but still the support of Rotary is there.